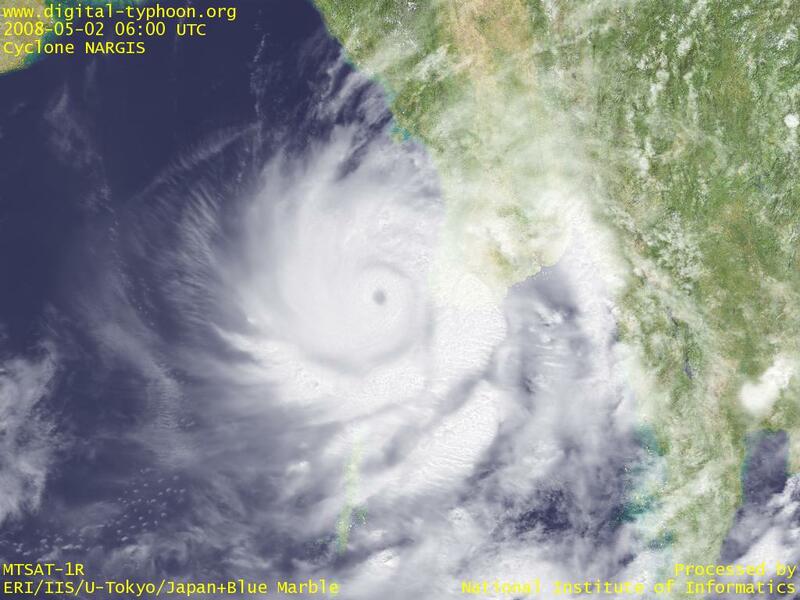 Cyclone NARGIS has made landfall at Myanmar. It was a severe cyclone, and was intensified rapidly just before making landfall in the south of Myanmar. This cyclone is a little weaker than Cyclone SIDR of the last year, which devastated Bangladesh and killed more than 3,000 people, but it is still a very strong cyclone as one in this area, so the occurrence of disasters is concerned. This cyclone has crossed the south of Myanmar, directly hit its capital of Yangon, and is moving to the north of Thailand, so the increase of rainfall and flooding should be watched in this area. Because many areas in Myanmar still lacks electricity and communication, the detail of damage is still unknown. Information about damage in Myanmar finally started to come out more than one and half day after the direct hit of the cyclone. More than 240 people were killed, and the number may increase. Telephone and Internet was cut down in many areas, so the estimate of damage seems to be difficult. In particular, damage in Ayeyarwady (Irrawaddy) River Delta and outlying islands is severe, and the number of casualties is updated to more than 350. On May 5, the updated damage information revealed that about 4,000 people killed, and 3,000 people are missing, which is dramatically larger than the previous information. It is also said that hundreds of thousands of people lost their homes. This may be one of the largest natural disaster since the independence of Myanmar (Burma), or these hundred years. For example, according to EMDAT - The International Emergency Disasters Database, as top natural disasters, a wind storm (cyclone?) 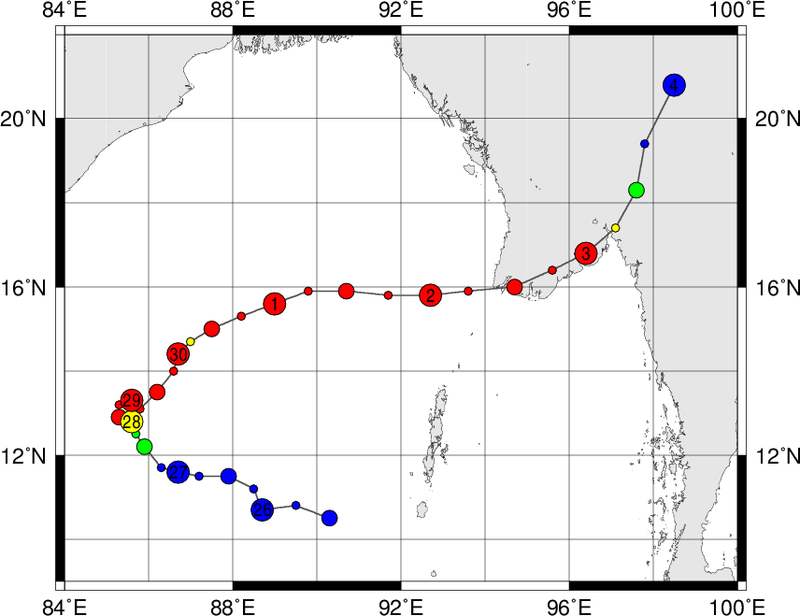 on May 19, 1926 is recorded to kill 2,700 people, and another wind storm on May 10, 1968 is recorded to kill 1,070 people, but the natural disaster of this cyclone is already much more extensive than those previous cases. In the night of May 5, the damage is reported to be much extensive with the number of casualties exceeding 10,000. In some places an entire village was flattened by storm surge, so the death toll may increase further. This time of year is also the worst timing for food, because this is a harvest season for cropping rice. To response this situation, Myanmar government decided to accept international aid, but it is still difficult to extend the aid rapidly because the movement and communication inside the country is controlled by the government. The attack of the cyclone is also in a sensitive timing in terms of politics, because a referendum is planned on May 10, but the inappropriate handling of the disaster may give a large impact on political situation in Myanmar. According to the report on May 6, the death toll is more than 15,000, and additionally about 30,000 people are missing, which is much larger numbers than previous ones (later death toll raised to 22,500, and additional 41,000 people are missing). In particular, the damage at Bogalay (Bogale) in Ayeyarwady division was extremely severe - 95% of the houses was destroyed, and 10,000 people out of the population of about 190,000 was killed by storm surge of 12 feet height. This area is in the low-lying river delta, so there are no places nearby to escape from storm surge. In Bangladesh, they are making cyclone shelters in low-lying costal regions for storm surge, but in Myanmar the construction of disaster mitigation infrastructure may be delayed. Information that should follow here is put on the Japanese page. Translation will be done when I have enough time. More information can be obtained from Wikiepedia: Cyclone Nargis and Google News. ReliefWeb. Disaster information on Tropical Cyclone NARGIS in Myanmar (TC-2008-000057-MMR). Before and after of the flooding in Myanmar observed by Terra satellite, NASA. Maps on cyclone affected areas provided by UNOSAT (UN Institute for Training and Research Operational Satellite Applications Programe). List of blogs related to Myanmar collected by BBC NEWS. NASA. List of satellite images and others related to the cyclone. JAXA. Satellite images of before and after the disaster and its analysis. Available in Japanese.